Gosh, I have had an interesting couple of weeks! You wouldn't believe! One of the highlights has been that I have been joined here, at the Shackette in Margaret River, by a lovely, young French couple who are backpacking around Australia and come to me via www.helpx.net. I so needed a hand with the garden, the kikuyu grass was turning into something like a triffid, and in my head I was imagining being taken over, as in the sci-fi movie, The Day Of The Triffids! You can see the vege patch at the back, it doesn't look like that any more! Any way, it has been wonderful to have a chirpy couple sharing the house with me. And, I must admit, it has brought out in me a few interesting feelings. I feel a bit like their Mother, in a weird kind of way, and I say weird, as I haven't had children so not sure what that feeling is like in reality. (I must say that I have had the pleasure of enjoying other peoples children in a caring capacity... any hoo!) The other feeling, is that of tour guide. I have this mad urge to show them our beautiful country. When you think about it, tourism in Australia, that is.. it is such a looong way for anyone to come. Even when you are here, it is then, still such a looong way to go to see things, people, places, events. And, how cool is it that this young couple have saved their precious money to come all this way, to our huge, vast, far away continent!? 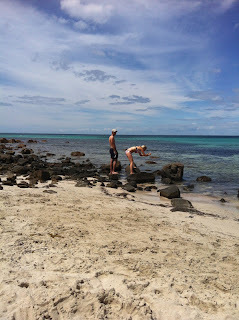 I have spent hours trying to warn them of some of the dangers, spiders, snakes, stingrays. The pitfalls of driving across the Nullabor. Introducing them to new food & beverages like our beer. Celine, found the vegemite and did try some, but after much spluttering spent hours trying to get the taste out of her mouth. I have tried to explain our Colloquialisms, like 'pub crawl', first I had to explain what a pub was, and then what 'crawl' meant. And, then it made me wonder why we even have a term for that any way. I admit, I love a pub crawl, a great excuse for a walk. Had a ripper in Sydney, starting in the city and finishing up at a cute local in Woollhara, where we had a yummy dinner. (Taxi home). So, back to being the tourist guide. 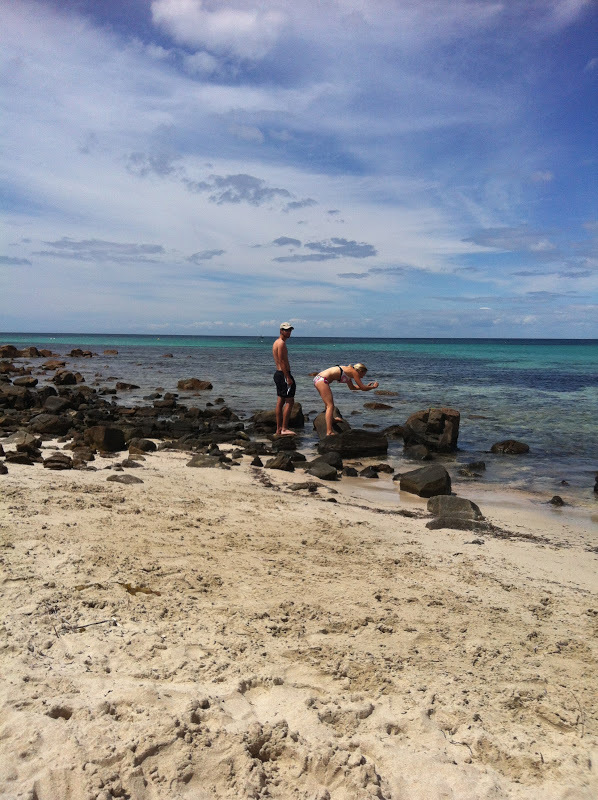 I have shown them around Margaret River, taking them out to Main Break and then the surrounding beaches. Pointed out Sea Gardens Cafe where they could perhaps meet Gilles, who is also French. But yesterday, I decided to show them the northern part of the South West Region. So we embarked from Margs and headed up to Eagle Bay, travelling Bussell Hwy, Chain Rd then Caves Rd via Dunsborough. These are the highlights that I felt were a good taster and would take us a full day. Eagle Bay; as Celine & Florian love walking, I set them off on a walk that starts from the boat ramp car park and heads north then north/west to a lovely surf spot halfway between Eagle Bay and Bunkers Bay. I think it takes about 15 minutes, one way, in the bush but following the shore line. It's a favourite of mine. As my feet aren't there yet, for the walking, Miss Dish and I, tested the cold water in the bay and trialled the new foot ligaments in the sand. We ate Silverbeet Pies baked by myself the day before, and then sunbaked ourselves in the warm sun. Next stop was the lookout at the end of Bunker Bay Rd, Bunker Bay. You could be in the mediterranean, the whales where thrashing about off shore, quite some distance out, but I have never seen them that active. It is just beautiful. We tried the Cape Naturaliste Lighthouse, but didn't realise we had to book a tour. 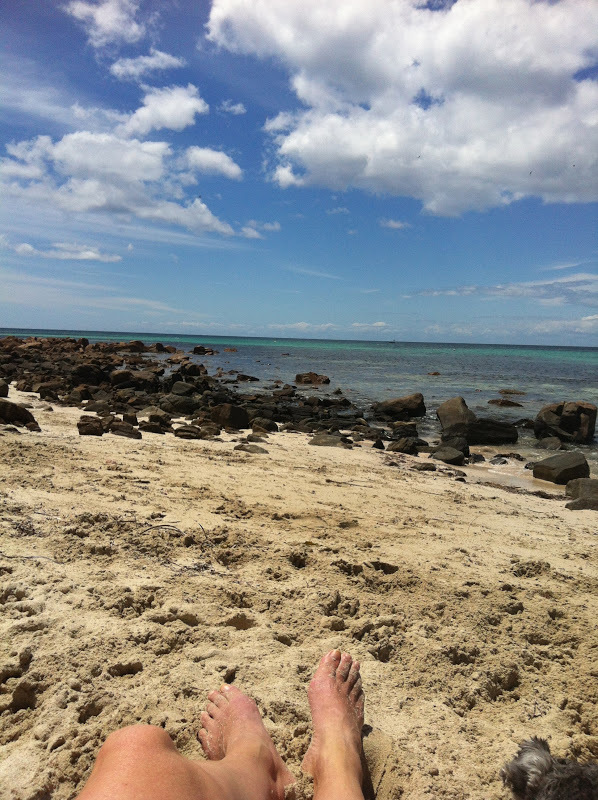 Yallingup, a must see. It is so famous for the massive surf, but, no surf yesterday, still beautiful. (Just a note, their caravan park is in one of the best locations, just directly across the road to the beach) Then of course, you can't drive past Caves House and not have a beer! I have been drinking Hahn's Super Dry on tap, Florian did concur, Celine drinking cider. The gardens at Caves House are a must to wander around, and there is a path that you can take down through the limestone cliffs to Yallingup Beach. We drove down Caves Road, a beautiful drive, one of my favourites. It is dangerous. Kangaroos and other drivers. Gracetown, was our last stop. We only drove to the top look out, the breeze was running up the coast, and no real sea. The swell crashing on the rock. We were rewarded with more whales and dolphins in the waters below. It was home again, no gardening for the day, but we were happy, sunburnt, our 'horizons eye' satisfied. We dined early with the community across the road at the Margaret River Soup Kitchen. They do a wonderful job over there. It is the cost of a donation, usually $5. A social event, Celine & Florian meeting some of the other backpackers from their work in the vineyards. Last night we had a really spicy dhal, brown rice, chilli sambal, salad and a mexican bean mix. Very yum. Thank you Dave. I would love to hear back from other people about their experiences backpacking around Australia and with people who have also enjoyed the company of backpackers.